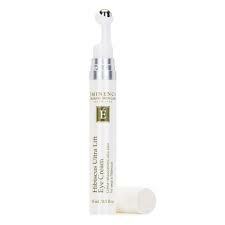 Eminence Organic Hibiscus Ultra Lift Eye Cream immediately lifts, firms and tones the eye area. How can an Organic product deliver such great results in just 2 minutes? Loaded with Organic ingredients to improve elasticity and tighten the skin to give you younger, more vibrant eyes. Organic Phytonutrient Blend™ [Red Currant Juice*, Aloe Juice*, Olive Leaf Extract*, Cornflower Extract*, Hibiscus Flower Extract*, Red Clover Flower Extract*, Elderflower Flower Extract*, Grape Seed Extract*, Carrot Extract*, Beetroot Extract*, Soybean Germ Extract*, Rosemary Leaf Extract* And Vegetable Glycerin*], Butylene Glycol, Provitamin B5, Escin, Vegetable Glycerin, Butcher's Broom Root Extract, Ammonium Glycyrrhizate, Gotu Kola Extract, Hydrolyzed Yeast Protein, Calendula Officinalis Flower Extract, Stearic Acid, Cetyl Alcohol, Olive Oil*, Cetearyl Glucoside, Glyceryl Stearate, Wine, Tara Tree Gum, Maltodextrin, Caffeine, Propanediol, Acmella Oleracea Extract, Hydrolyzed Hibiscus Esculentus Extract, Dextrin, Alcohol Denat., Coleus Forskohlii Root Extract, Green Algae/White Lupin Protein Ferment, 1,2 Hexanediol, Caprylyl Glycol, Tropolone, 'A'ali'i Flower Extract, Māmaki Leaf Extract, Shea Butter*, Jojoba Seed Oil*, L-Arginine, Stevioside, Babassu Oil*, Polyacrylate Crosspolymer-6, Coconut Oil*, Arnica Montana Flower Extract, Algae Extract, Coconut Oil, Monoi Flower Extract, Vitamin E, Soybean Oil, Biocomplex2™ [Acai*, Lemon*, Barbados Cherry*, Indian Gooseberry*, Baobab*, Camu Camu*, Carrot*, Coconut Water*, Goji Berry*, Tapioca Starch (from Cassava Root)*, Alpha Lipoic Acid And Coenzyme Q10], Vegetable Glycerin*.